The following image is courtesy of F. Wilson who took the photo after a visit to the Selwyn District Council. 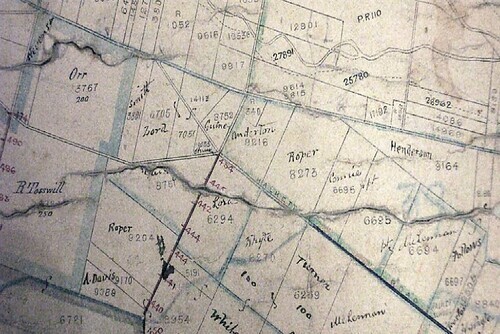 It is a photo of a water race map from 1881 and shows who owned or ran the farms at the time in the Courtenay area. Jabez Lord farmed Rural section 6705 and 7501 and also 6291 across from the St Matthew's Church, Courtenay. Thomas and Sarah Ellen Anderton farmed rural section 9216 on the corner of what is now called Old West Coast Road and Intake Road. Other names on the map are Orr, Henderson, Guiney, R. Tosswill, Roper, Turner, Whyte, A. Davis, McLennan and Smith.